George Gaskin admitted it was a surreal day as he scored hat-tricks for both Littlehampton and Horsham yesterday. The 26-year-old striker netted a hat-trick in Golds' SCFL Premier Division 4-1 win at Worthing United in the morning, before he played for Horsham in the afternoon and scored a treble as a second half substitute in the Hornets' 8-1 Ryman League South Division victory against Godalming. Gaskin had never played for two teams on the same day before, although had scored six goals in a game when playing junior football. He said: "It was all a bit surreal but it was a good day and my phone went mental yesterday. It's not something you ever think about, so it was all a bit of a surprise. "I played the whole game at Worthing United and although the pitch was quite heavy, I felt all right afterwards and went up to Horsham. "Dom (Di Paola; Horsham manager) asked me to help them out as Terry Dodd is out injured and Littlehampton haven't got many games over Christmas, so I said I'd play a few games for him. "I went on with 15 minutes to go and my first thought was just to go on and get a goal. I never even thought about a hat-trick as I didn't know how long was left." Gaskin scored 24 goals last season when he was Littlehampton player-manager but has just been concentrating on playing this campaign. 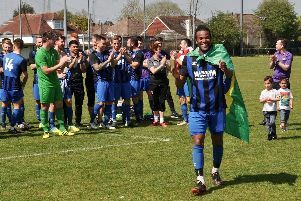 He netted 21 goals for SCFL leaders Shoreham at the start of the season, before he rejoined Littlehampton and has scored nine goals for Golds, along with the three for Horsham to take his season's tally to 33. Gaskin said: "I wanted 40 before the season started but I've got 33 on Boxing Day, so I'll just see what happens now. "I scored 24 last season so have bettered that already and my best total in a season is 45, so I'll just take things as they come. As a striker you have runs when you don't score and then runs when you get a few goals. "I'm playing the next four or five games for Horsham and I'll just take things from here and see what happens now."